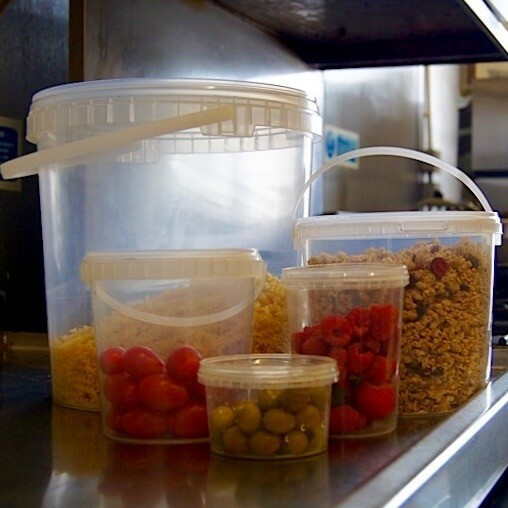 In restaurants, takeaways and other catering environments, good food storage is critical for holding onto your hot food licence. But failing to comply with the regulations could also result in customers becoming ill or, in extreme cases, death. To make life a bit easier in busy kitchens, many caterers like to prepare meals or ingredients ahead of time and store them until they are ready to use. Plastic food containers are perfect for this kind of food storage, but it’s important you use them safely. Keep dry foods like flour and rice off the floor in clean, dry and well-ventilated rooms. Make sure you only use food grade containers. This should be specified by the manufacturer. If you decant food from its original container to a plastic food pot, make sure you keep hold of the ingredients list to make sure you can keep track of potential allergens. ‘Use by’ or ‘best before’ dates should also be marked clearly. For dishes that are prepared or cooked, use stickers or another safe type of labelling to let everyone know what’s inside and when it was made. Follow the ‘first in first out’ method of stock rotation. Where possible, separate fridges should be used for storing raw and ready-to-eat food to prevent the spread of bacteria. If they are in the same fridge, raw meat/poultry/fish should always be stored below ready-to-eat food in a clearly distinguishable part of the fridge and in covered containers. Plan what stock you need on a shift by shift basis and make sure staff know what stock is required for each shift. This will help prevent food going bad unnecessarily. Don’t keep food in uncovered plastic pots. Make sure you have a smooth fitting lid and keep it on at all times. If you are sending prepared materials to a customer, another site or a third party, make sure you have tamper-evident lids so the recipient can be sure of the products integrity.